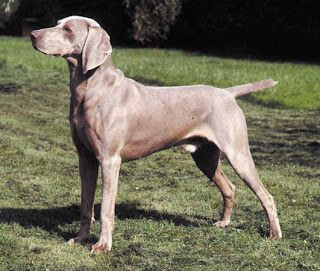 The Welmaraner dog breed originated in Germany. They are pointers and have many talents. This breed can be used for police work, search and rescue and tracking. This breed of dogs is energetic and athletic, they possess a lot of stamina and intelligence. This breed of dogs is very intelligent and alert, they can be used as a a watchdog and as a guard dog. The Weimaraner truly has a unique personality. They are cheerful, happy and full of life. They can make a strong belonging to the members of family and can become destructive if they are left alone. They do well with children and older people, This dog breed gets along with other dogs but not with cats. They are brave and loyal and are very passionate. This breed of dogs has a single coat which is short, fine and sleek gray. Their coat comes in multiple colors. This breed is also known as Silver Ghost and Gray Ghost. This breed of dogs is a quick learner, they will not respond to hard and harsh methods of training, Training should be given with fairness and patience. The Weimaraner dog breed needs consistent exercise to remain fit. They love to play with a ball and enjoy the family play sessions. A large yard is preferred for them. They do okay in apartments if they are provided sufficient exercise. This dog breed requires regular brushing with a firm bristle brush, bathing should be given when needed with dry shampoo. The Weimaraner is prone to bloating, so small meals two times a day are best. They may suffer from hip dysplasia but are generally healthy and free of any major dog diseases.